With sensors included as part of a Vantage System home owners can enjoy the full benefits of an automated home. Tasks that used to require toggling a light switch or pressing a button can now be triggered simply by entering a room or by changes in ambient daylight. 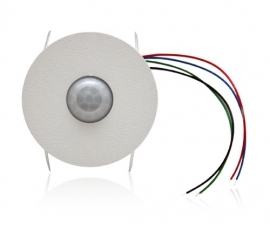 The Vantage Flush Mount Sensor enhances the abilities of a Vantage System by using light and motion to trigger tasks. Inconspicuously mounted in either the ceiling or wall, the 360 degree detection compact dome lens senses human body motion to trigger lights, security cameras or other devices connected to the Vantage System. Using a process known as “daylight-harvesting” lighting levels can be maintained at a pre-determined and consistent level by measuring light in a specific area and relaying the information back to the Vantage System. With this information the Vantage System uses ambient light in combination with the lighting system in the home to maintain the ideal illumination levels. Why pay for electricity to light an empty room?